 Vagnsset med 2 personvagnar typ Bm "Euro-Express"
Vagnsset med 2 personvagnar typ Bm "Euro-Express"
By buying this product you can collect up to 2788 bonuspoints. Vagnsset med 2 personvagnar typ Bm 'Euro-Express', vagnarna har innerbelysning, figurer medföljer, totallängd över buffertar 56,5 cm, epok VI. Model: This is a soccer fan car set. The entry doors have one-piece door windows. Some of the car windows on the model are open. The entries have folding steps. The cars have Minden-Deutz heavy design trucks with double brake shoes and a separately applied generator. Both cars have factory-installed LED interior lighting and operating current-conducting couplers. Maintenance-free warm white LEDs are used for the lighting. The 73407 marker lights can be installed on both cars. 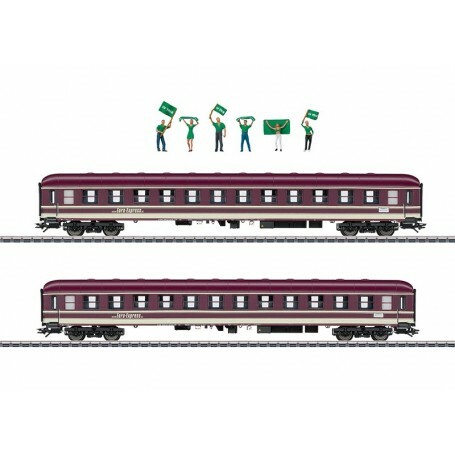 A 6-piece set of figures (soccer fans of SV Trix) from the firm NOCH are included (read the instructions for use).Total length over the buffers approximately 56.5 cm / 22-1/4'. Prototype: Two type Bm compartment cars for Euro Express Special Trains GmbH & Co. KG. Bordeaux violet paint scheme. One-time series. The car with sound and the car set to go with this set are offered exclusively for the MHI under item numbers 43948 and 43947. The class 146 electric locomotive to go with this set is offered exclusively for the MHI under item number 36626. All of the cars include factory-installed LED interior lighting. Operating current-conducting couplers.Some windows open.